The dumbbell bicep curl is among the most commonly practiced free weight exercises for strengthening the arms. Designed to isolate the biceps brachii muscles, the dumbbell curl exercise directs most of the weight directly to the biceps for quick and effective muscle building. Although there are no official weight averages for dumbbell curls across the board, a general range can be estimated based on information gathered from a variety of sources. Always consult your doctor before beginning this or any exercise regimen. The amount of weight you can lift depends on a number of strength and stability factors. Weight lifters who curl low repetitions of very heavy weights, for example, are much more capable of lifting a single heavy weight than a trainer who lifts multiple repetitions of low weights. The estimates offered by the Testosterone Nation website suggests an average barbell curl weight of 80 lbs. for men or 40 lbs. for women. Because the barbell curl performs the same motion as the dumbbell curl, except with both hands, the average curl weight for this type of exercise would be approximately half that per arm 40 lbs. for men and 20 lbs. for women. The Top End Sports website lists a number of average weights recorded from senior fitness tests, which are designed to gauge the upper body strength of seniors between the ages of 60 and 94. According to the results, men aged between 60 and 64 could perform on average 16 to 22 repetitions of 8 lb. 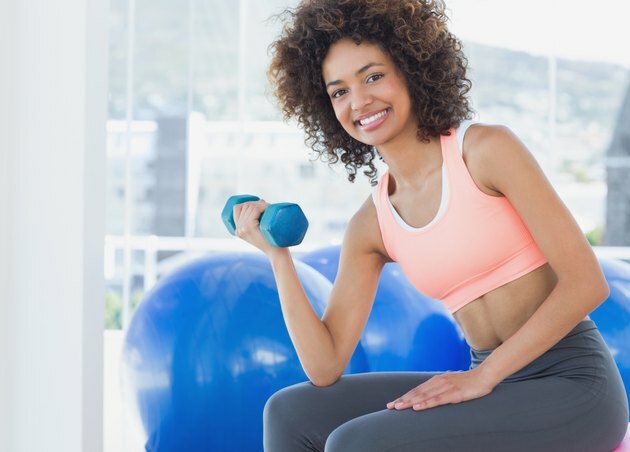 dumbbell curls, while women of the same age performed 13 to 19 repetitions of a 5 lb. dumbbell. The strength levels dropped considerably among 90 to 94 year-old men and women, who could only perform repetitions of 10 to 14 and 8 to 13, respectively. Although there are a number of methods for finding your personal lifting weight, experiment until you find a weight that you can lift 12 to 15 times. Selecting the right weight for your dumbbell curl exercises is ultimately a personal choice best determined with trial-and-error, or by mathematical equations, such as the one repetition maximum formula. According to the National Physiques calculator, you can gather your one repetition maximum by computing the results of a lifting test. Select a comfortable weight and perform as many dumbbell curls as possible. Multiply the number of repetitions by .033 and add 1. Finally, multiply this number with the weight that you lifted to receive your one repetition maximum. For example, if you lifted eight repetitions of 30 lbs., your one repetition maximum will be 38 lbs. Use this number to determine your average dumbbell curling weight, and gradually increase it as your strength improves.